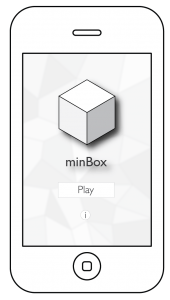 minBox is an iPhone application that allows you to create minimal music by making use of pre-recorded sounds on your device. The app allows you to use those sounds and edit some parameters like the pitch, reverb, volume, etc. With this project I would like to explore the idea (des)fragment and related somehow with the philosophie of Â the ‘musique concrÃ©te’ that has emerged during the 50’s. In the context of the course of Multitouch Interaction I would like to develop a prototype that allows you to add 5 different sounds/samples and play and interact with their parameters.